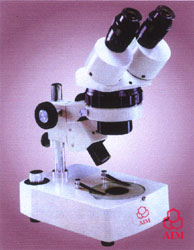 A highly versatile Binocular Microscope for a wide range of scientific and industrial applications. Equipped with Binocular Head inclined at 45º, rotated through 360º can be locked in any position by using thumb screws, the interpupilary distance is adjustable between 55 to 75 and the right eye tube has dioptric focusing adjustment, heavy and stable stand. 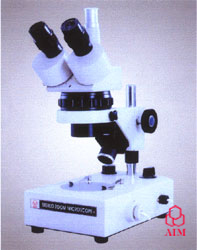 The significant advantage of stereoscopic microscope is that by using two optical systems, and erect image of the object can be seen in 3 dimensions in the field of view with high resolution. Focussing by rack & pinion mechanism with adjustable tension collar. Provided with integral Illuminator, two lamps are fitted to provide both transmitted & incident illumination. The lamps can be switched on separately or together. Complete with a glass plate having two stage clips. Work on 220V-240V AC or 110V-120V AC, 50-60 Hz. Magnification : 20x & 40x with flat field. Supplied with Dust Cover, Duster, Cleaning Brush in wooden storage Cabinet with lock & key. 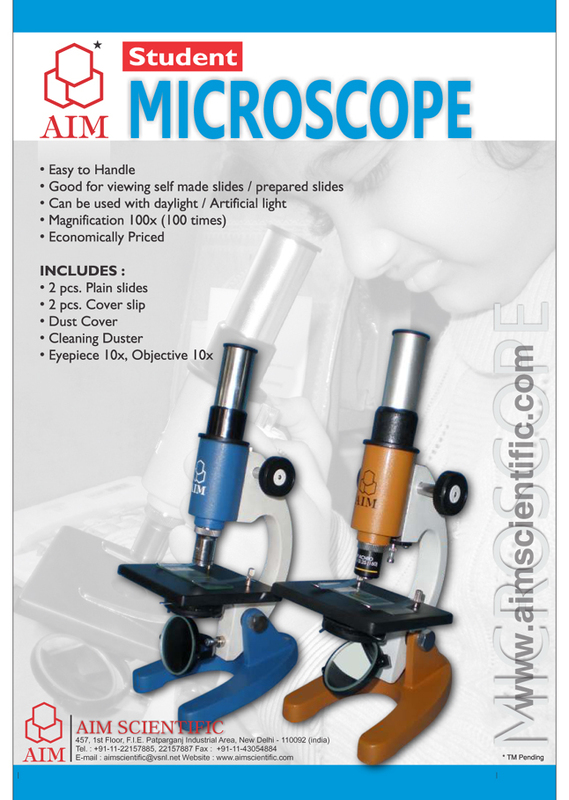 ¤Binocular tube with an inclination of 45º for greater ease of observation. ¤Extra wide field eyepices 10X (paired). ¤Magnification 10x to 50x (Standard). ¤Crips, erect images with high resolution and excellent stereoscopic effect. ¤Standard working distance 80mm regardless of magnification. ¤Interpupillary distance from 54 to 75mm. ¤Dioptric adjustment with a range of ± 5 diopters is possible with both Oculars. 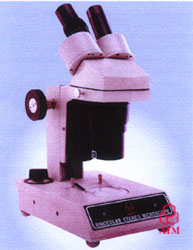 ¤Binocular body can be rotated a full 360º and locked in any possible desired. ¤Once brought in focus, image remains clear and sharp throughout the whole zoom range. ¤Dual illumination system having incident and transmitted illuminators, for individual use or both at a time controlled through solid state built-in transformer 6Volts 20Watts for halogen bulbs. ¤Packed in wooden storing cabinet with operation manual, dust cover etc. ¤Trinocular tube with an inclination of 45º for greater ease of observation. ¤Trubicular body can be rotated a full 360º and locked in any possible desired.